Still image of RPC-003-01 instances in battle. Hazard Types: Animated Hazard, Sapient Hazard, Grouped Hazard, Self-Replicating Hazard, Ballistic Hazard. Containment Protocols: RPC-003 is to be stored in Locker 38 when not in use. All personnel with clearance of Level 1 and above may spectate the biweekly "wargames" conducted by Dr. Alex Fisher. (Note: betting is strictly prohibited). Use of RPC-003 is only authorized in blast hardened locations (See Incident 003-3). 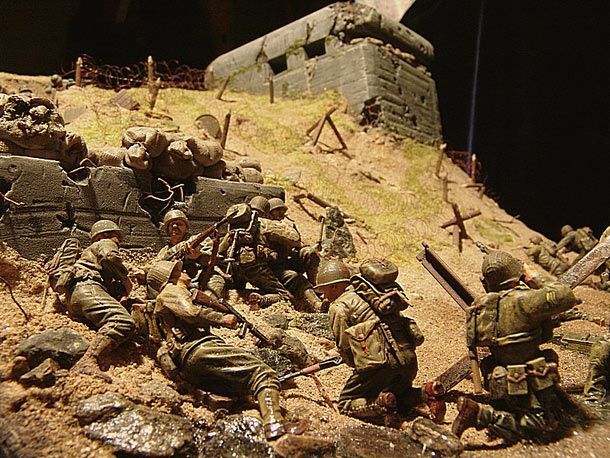 Description: RPC-003 is a large grey bin containing approximately 1000 plastic soldier figurines along with dozens of different structures and vehicles divided into 4 separate armies bearing different uniforms, these being the Wehrmacht, United States Army, Imperial Japanese Army, and the Red Army of the Soviet Union. All four uniforms are identical to those issued during WWII. New figurines identical to those removed will regenerate at an average speed of 5 figurines per minute. Upon removal from the bin, the figurines, hereafter referred to as RPC-003-01, will immediately become sentient and follow the orders given by the one who removed them. If no orders are given by the subject then RPC-003-01 will act on their own initiative, establishing a chain of command. RPC-003-01's first action after forming a chain of command is to establish an HQ. While able to make use of the structures provided by RPC-003, they are perfectly capable of constructing their own structures. An HQ typically includes an officer's building, a barracks, a field hospital, a vehicle depot, an air pad/runway and a central flagpole. After the completion of the HQ, RPC-003-01 will begin construction of vehicles suitable for use in exploration. Upon completion, RPC-003-01 will begin deploying exploration teams to various strategically sound locations and establishing outposts. This behavior will remain largely unchanged until they encounter another "country." Upon encountering what are considered "foreign powers," RPC-003-01 instances have shown the ability to communicate and perform complicated political activities such as defining borders, negotiating, espionage, and organizing joint exercises. If communications break down, instances of RPC-003-01 will begin preparing for war. If not prevented, a declaration of war will inevitably occur. During a biweekly wargame viewing, after the US flag was destroyed, instead of surrendering, RPC-003-01 instances retreated to a series of nearby bunkers that had been constructed. Following this retreat, dozens of hidden silos opened launching nuclear missiles which proceeded to level the room, destroying all RPC-003-01 instances.